Follow the exit airport signs to SR60 West/Clearwater. Take SR60 west for approximately a 1/2 mile and take Veteran's Expressway North to the Linebaugh Avenue. DO NOT GO OVER THE BRIDGE. Exit (first exit after the toll booth) and follow Linebaugh Avenue West to Countryway. Turn right on Countryway and follow Countryway to Racetrack Road; cross over Racetrack Road at the traffic light. Countryway turns into Nine Eagles Drive at this point. Follow Nine Eagles Drive through the front gate to the golf course. Go north on Rte. 611, McMullen Booth Rd. and follow it to Rte. 580, Main Street. Take 580 east to Forest Lakes Road and turn left. Follow Forest Lakes Road over Tampa Road/Hillsborough Ave. to the Race Track Road intersection. Turn left on Race Track Road and follow to Nine Eagles/Countryway intersection. Turn left on Nine Eagles Drive. 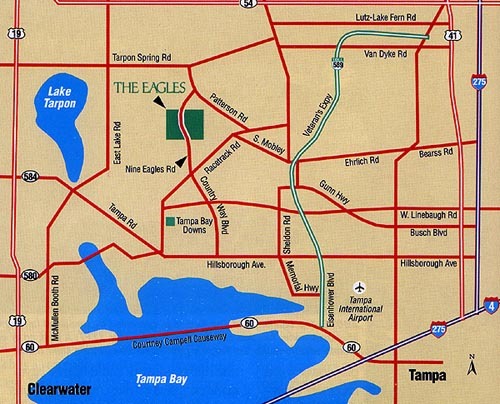 Follow Nine Eagles Drive until it dead ends at the Front gate. Take US 19 south to Rte. 582, Tarpon Avenue and turn left going east. Rte. 582 Tarpon Avenue changes names to Keystone Road and then to Tarpon Springs-Lake Fern. Continue on Rte. 582 crossing over Rte. 611 East Lake Road. Follow Rte. 582 until you see Patterson Road. Be careful, Patterson is a small two lane road on your right side. Turn right on Patterson. Follow Patterson for approx. 3 miles and The Eagles back entrance will be on your right hand side.